This documentation guide covers all the necessary steps for installing and setting-up the Criss Cross skin with your Thesis 2.1+ installation, plus a content styling guide. 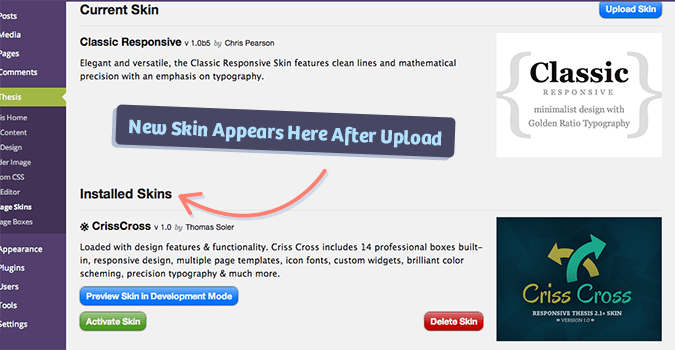 From your ‘Thesis Home’ section of the WordPress Admin, visit the ‘Manage Skins’ page found within your Thesis sidebar menu or inside the ‘Skin’ drop-down menu. Once you are on the ‘Manage Skins’ page, click the blue ‘Upload Skin’ button in the upper right corner. Select the appropriate .zip file and click the green ‘Add Skin’ button. 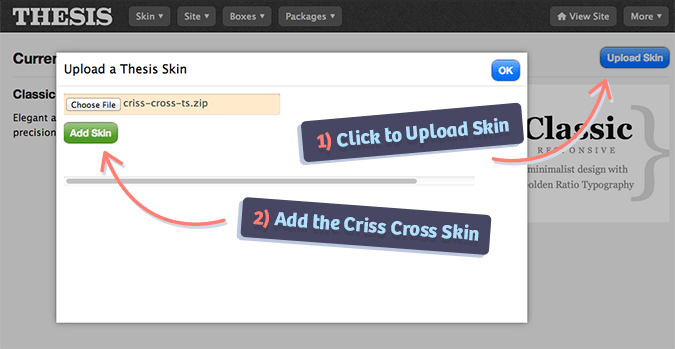 After uploading Criss Cross you will see it added to your list of available Thesis skins. Click the green ‘Activate Skin’ button found below the skins description and if all was done accordingly, Thesis will now be using the Criss Cross skin. After activating the skin all settings will be their out-of-the-box defaults. Further documentation sections will cover the customization process with design options, content options & more. If you still have questions about this documentation, please start a new topic within the appropriate content section on the support forums here.